Organized people are the envy of many and in truth many organized people don’t feel that they have everything sorted or organized either, they have their problem areas too. However, they are aware of what they need to do and when, they have their days sorted and are on top of what they need to do to qualify as being organized. They might have a secret messy closet or the only way they know what to do is because they write things down and plan to make their day look like perfection, however, copying habits of organized people can help those less organized! If you mimic those actions of organized people until they become your regular routines and you adopt the habits, you will become an organized person. The most important habit of an organized person is planning; you have to plan to ensure that you are doing all the things that you need to, over the course of the day. Planning allows you to organize your time so not to miss something that you need to do. Your planner becomes your organizing tool, you must use this to work out what you need to do and when; it is your day, it should tell you about appointments and what tasks you need to do. Time: you have the same amount of time as the next person, knowing how to use it effectively is an important part of being organized. Know how long it takes to get to an appointment, add in extra time in case of delays. Know how long a task takes to complete, plan your time but don’t forget to give yourself a break, plan breaks to motivate you to get something completed. Routines are key to an organized person, they know what to do and when. By copying a routine of an organized person, it can help to build your own routines. Some things I do at certain times and others I will do after a certain event. For instance, I walk my dogs after they have eaten breakfast, when they have breakfast each day can vary depending on the time I get up and what I have planned for the day, they know this routine too and that helps to keep me on schedule. Take notes, don’t expect to remember things and this way you are less likely to forget. I tend to write quick notes like an appointment on a sticky pad, for when I have time to go through them; I take a few minutes a day to go through these, I transfer them to their proper place and discard the sticky note. Take time for you, it is important that you learn to take care of yourself, without a way to get rid of your stress or anxiety you will never become completely organized. You must have the right amount of sleep; being tired will have a negative impact on your day. It isn’t always possible to have the perfect amount of sleep every night, children will see to that aspect, but you try to get as much sleep as you need, if you’re tired you won’t do the things that you need to do, as effectively. If you follow the habits of organized people, it will help you pick up the habits and eventually they will become your habits too. 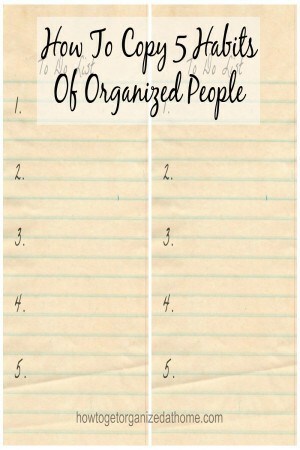 Therefore, if you mimic the habits of organized people it will have a positive impact on how organized you are and help you develop your organizing skills. Everything you have listed is so true! So true! I’m working on establishing good routines, but don’t have that down yet. 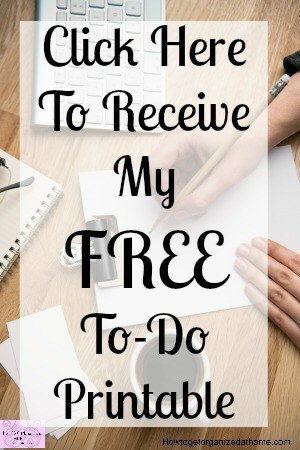 I am an avid list maker – groceries, to do, etc. Thanks for the good reminders! I love how you include self-care (#5) on the list of traits. I must say, that I really need to work on that one…I am trying to function on 4 hours of sleep today, so reading this really hit home with me this morning! I have to write stuff down or I am totally lost, I can’t remember jack. Thanks for posting. Hello from Motivation Monday. I am like that if I don’t write it down I will forget! But sometimes I make quick notes and then I wonder what they mean too!